India's Kumaravel Prem Kumar bagged a silver in long jump on the final day of Asian Indoor Athletics Championships in Doha. 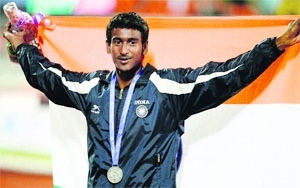 Prem Kumar cleared a creditable 7.92m in his final attempt to win the silver. Zhang Yaoguang of China won the gold with a best effort of 7.99m. Another Indian, Ankit Sharma could manage only 7.66m with four fouls which marred his chance to win a medal. Om Prakash Singh Karhana added a bronze in shot put by clearing a distance of 18.77m. Four of his attempts turned out to be foul. With this, the Indians signed off their campaign in Doha with 1 Gold, 3 silver and 3 bronze medals. Meanwhile Jharkhand capital Ranchi has been confirmed by the continental body as host city of 2017 Asian Athletics (Outdoor) Championships.